ARROW and CONSTANTINE will have a crossover this fall as Matt Ryan is reprise his role of John Constantine on The CW drama. CONSTANTINE was canceled after one season this May, but since the show falls into the DC universe, things worked out to bring his character to ARROW. UPDATE: Per CW, Ryan will appear in episode 5, “Haunted,” and “John Constantine is a weather worn exorcist and expert on the supernatural and the occult. He is a detective, magician, and a hunter of demons, and will provide critical support to Oliver (Stephen Amell) when arrows aren’t enough. Details are still being kept on the DL, but are you excited to see Constantine on ARROW? NBC has canceled its freshmen shows CONSTANTINE, MARRY ME, and STATE OF AFFAIRS. But there may be hope for CONSTANTINE to live on, according to showrunner Daniel Cerone. Will you miss MARRY ME and STATE OF AFFAIRS? And do you hope CONSTANTINE finds another home? Since her introduction into the CONSTANTINE world, Zed has helped the team with her visions. While those visions occasionally caused her physical trauma, it took Zed collapsing at a hospital last week for the truth to come out: she has a tumor. And despite the risks of not dealing with it, Zed opted to live with it and not chance losing the gift she was given. “She was running away from her family — which we touched a little bit through the season: her family trying to kidnap her — and anyone who is a true fan of [the] “Hellblazer” [comics] knows what that past is, and that her father is the leader of the cult, and basically wants to kidnap her,” she continued. “Zed does not want that purpose. She wants her own purpose, her own journey, her own destiny. And she finally found it last episode, saying, ‘This is what I have to do, I know exactly what I’m doing now.’ That’s Zed’s mindset: time to rock and roll, baby. While Zed may have found her zen with the tumor, the reveal initially threw Celaya. CONSTANTINE is introducing Anne Marie, a woman from John Constantine’s past, in tonight’s brand new episode, and according to series star Matt Ryan (Constantine), it kicks off one of their best arcs. Deadline was first to report the news. Are you sad CONSTANTINE’s first season will be a short one? In New Orleans, Constantine’s (Matt Ryan) unusual knowledge of a string of crimes gets him into trouble with Detective Jim Corrigan (guest star Emmett Scanlan). He must form an unholy alliance with Papa Midnite (guest star Michael James Shaw) when a voodoo ritual to help people communicate with their dead loved ones takes a deadly turn. Papa Midnite — a familiar face to “Hellblazer” fans — makes his first appearance on CONSTANTINE tonight…and his relationship with John is, well, complicated. CONSTANTINE has a new female lead in Angélica Celaya, and while viewers got a teeny tiny glimpse of Zed at the end of the pilot, they’ll be seeing a lot more of her in tonight’s second episode. CONSTANTINE is the latest DC Comics character to be adapted into a television series (in this case, from the comic book series, “Hellblazer”), but this one is a bit more grounded than many of the others. 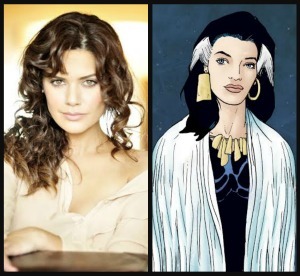 And while the show is only making its debut on Friday, it’s already had some changes that have made headlines: original female lead, Lucy Griffiths (Liv) exited the series in July, and post-pilot, a new female lead, Angélica Celaya (Zed), will go toe-to-toe with Constantine. The casts of ARROW, THE FLASH, GOTHAM, and CONSTANTINE took part in a massive DC/WBTV panel at Comic-Con. Check out some photos of the 34 panelists!